Remember that Transformation Challenge I told you about back in September? Well, it finished up on Christmas Eve. And it finished up with a BANG! Isn't that incredible???? WAY TO GO, KYLE!!!! 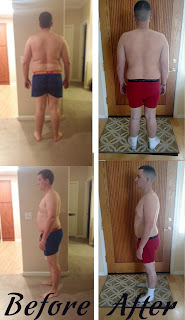 And, not only did Kyle receive mega bragging rights, he also won... $1,000.00 www.RecipeForFitness.com is proud to congratulate Kyle on his amazing transformation! !